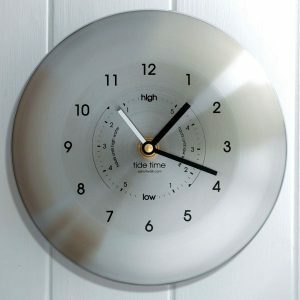 Time and tide clock showing the time of the tides at your location. An ideal gift for sailors, surfers and all sea lovers. The combination time and tide clock gives you an innovative and convenient guide to tides, whilst also providing conventional time keeping. Synchronised to the moon’s daily cycle. Shows the time of the tides at your location. 200 x 200mm (8 inch) Wall mounted, comes with instructions and full guarantee. An ideal gift for sailors, surfers and all sea lovers. The recycled range are hand crafted in the UK and made from vending machine coffee cups direct from the national Save-A-Cup scheme. 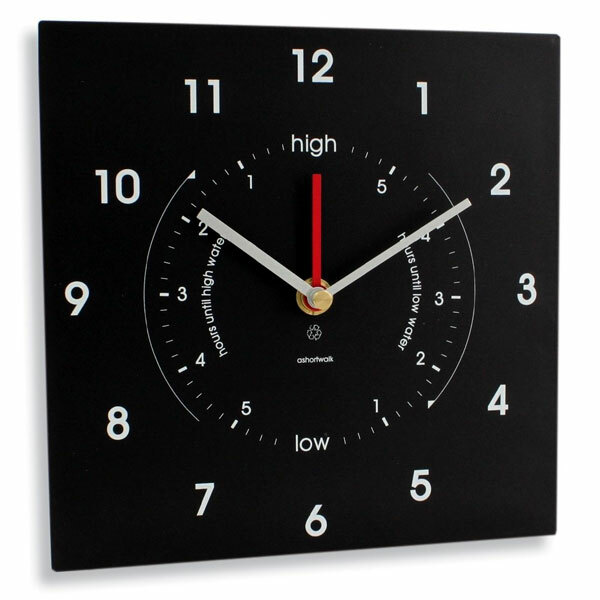 The clock is set by turning the hand to the high tide position at high tide for your location on a full or new moon. It will then keep step with the moon and show the time of the tides. The hand rotates once every 12 hours and 25 minutes, which is twice each lunar day.